Cloud Adoption Trends in Financial Services: Are You Ready for the Future? From Main Street banking to Wall Street investing, the financial services industry is being disrupted by digital, social, and mobile innovation. Join Nucleus Research, Salesforce and Informatica as they discuss the most disruptive trends in the financial services industry and how financial institutions are leveraging these trends to gain a competitive advantage. 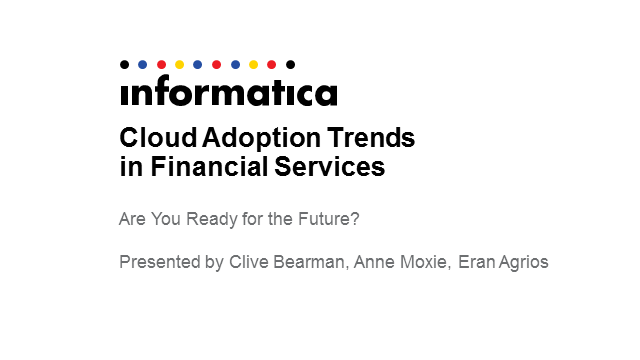 Title: Cloud Adoption Trends in Financial Services: Are You Ready for the Future?